ABS master smith J.D. Smith will join three other bladesmiths on the latest installment of The History Channel’s Forged In Fire tonight at 10 p.m. Eastern. Forged In Fire is a reality TV show in which the contestants are charged with designing and making a knife of their choice via various requirements imposed by the show’s judges—ABS master smith James Neilson, ancient weapons specialist David Baker and combat specialist Doug Marcaida. The smiths have three hours to complete the knife inside the studio’s well-equipped forge—and host Wil Willis is there to ensure the contestants know when time is almost up. In the end of the studio segment, two smiths emerge and are charged with building a special knife, sword or other edged tool of the judges’ choosing at the smiths’ home forges. The smiths have five days to complete the project and the piece deemed best in terms of performance, design, etc., by the judges results in the winner earning a $10,000 prize. You never can tell what may happen—both in the studio forge and at the smiths’ home forges. 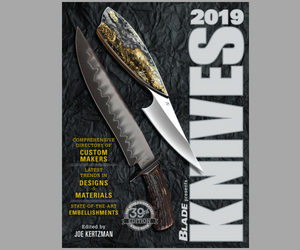 Everything from the contestants catching the floor and even themselves on fire, unusual approaches to making knives, and the pressure and confusion that result from the time limits on making the knives can result in some high drama. It’s really entertaining TV and the ratings the show is receiving have been steadily climbing as a result. After five weeks, Forged In Fire has gained double-digit growth across all key demographics compared to its live premiere: +74 percent in the 25-54 age group, +73 percent in the 18-49 age group and +32 percent in total viewers. In all, Forged In Fire is averaging 1.4 millions viewers—arguably the most people to see/watch a knife-related event in history. In tonight’s episode, an Elizabethan rapier will be the ultimate blade project the finalists will make for the judges’ perusal. Be sure to check your local listings for when the program will air in your time zone.